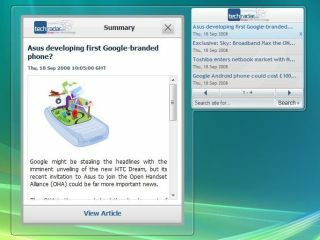 You can use Windows Vista Sidebar gadgets for browsing eBay, checking train times and weather forecasts, and now there's one to bring you the latest news and reviews from TechRadar, which we've just had created by ace gadget builders BuildAGadget.com. The TechRadar gadget brings the latest news to your desktop while also offering you a quick way to search our news and reviews without opening a browser. You can toggle the search options between news and product reviews by clicking the options icon on the gadget (it looks like a little spanner that appears at the top right-hand side of the gadget when you mouse over it), then selecting Options > Search, and choosing either 'search website' or 'search product reviews' from the drop-down menu. The Options window also lets you change the number of stories displayed, how often the RSS feeds update, and more. BuildAGadget.com is a relatively young company, which sprouted as an offshoot of its parent company in 2006. We asked Tyler Cross, Chief Technology Officer about the company and why they decided to go into gadget building. "The idea spawned from the realisation that the gadget format was highly efficient in that it allows for useful processes to take place in a small, easily accessible area," Cross explains. "Our initial focus was on creating gadgets with broad appeal such as our XM Satellite Radio gadget, which has over half a million downloads. We quickly positioned ourselves as the predominant gadget developer on the Windows Vista Sidebar Live Gallery. Most recently, we launched an initiative to provide custom gadgets for client websites at a very low price point. TechRadar and Windows Vista Magazine were instrumental in helping us refine this product." "First, we actively solicit and respond to user feedback and suggestions. Because we are ultimately providing for our customer – we use the input from our customers as the primary guidance for the development of our products. "Second, we carefully analyse market trends to determine what would be useful as a sidebar function. We don't necessarily focus on what is most popular; we also account for trends and niche functionality. "Third, we maintain a focus on quality. Even some of the most basic ideas and functions can be highly beneficial if performed reliably and efficiently, and, in contrast, the best ideas can be useless if the gadget is erratic or unstable. "Fourth, we keep our in-house gadgets completely free. We don't like the bait-and-switch approach of reduced functionality without a subscription, so we monetize openly via our website and other subtle means." Actually building the gadget can take anywhere from a few hours to a few months, Cross explains. "The amount of time involved greatly depends on the complexity of its purpose and the number of features it has. A high-quality product cannot be achieved without significant amounts of time being spent on its development. Making sure that the gadget is well-tested, stable, and provides high-quality graphics and an intuitive interface are tasks that can take nearly as long as the coding." But that's not to say that you can't create your own gadget. "Anyone who has dabbled in creating web pages with HTML can create a simple gadget," says Cross. "All you really need is a text editor, an image editor, and a copy of Vista (or whatever platform you want to create a gadget for) to get started.